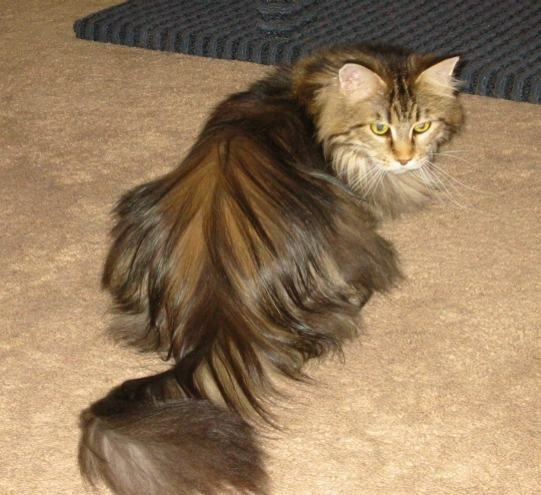 Born 5/26/98, Moxie is a brown classic tabby female with an elegant, refined look. Heart: Normal and healthy. Most recently screened via doppler ultrasound on 2/17/02, by Dr. Jerry Woodfield, board-certified veterinary cardiologist. Previous ultrasounds (also normal) were on 3/8/00 and 4/5/01. Pedigree: Moxie is out of Frosty and Hoppy. 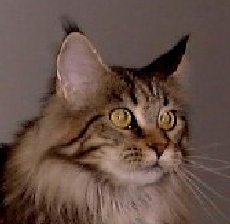 Click here for Moxie's Pedigree. 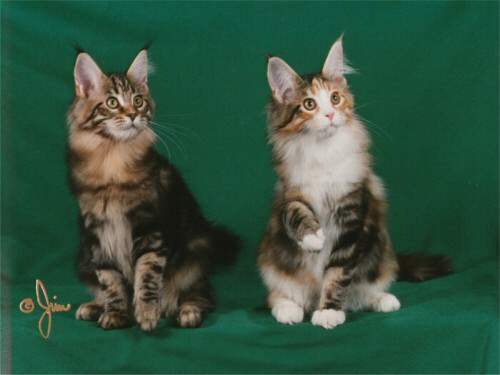 Moxie's first litter was born in August 1999; dad was SGC AnTarCin Ahnold. Moxie's second litter was born in May 2000; dad was Wills. 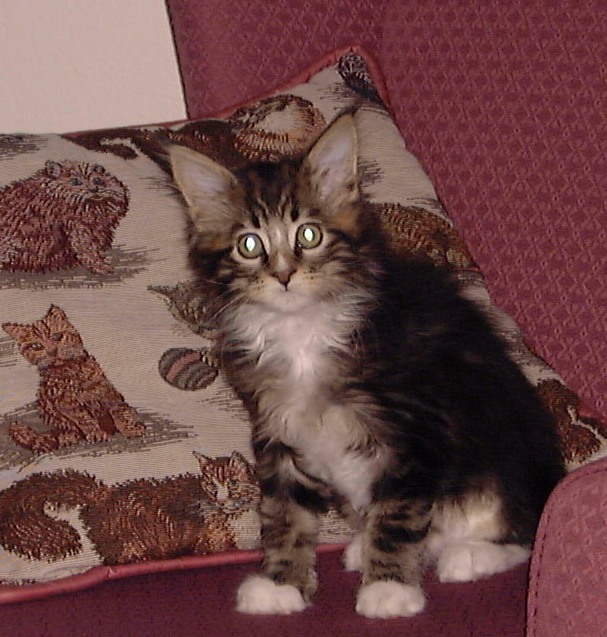 Moxie's third litter was born in June 2001; dad was Wills. 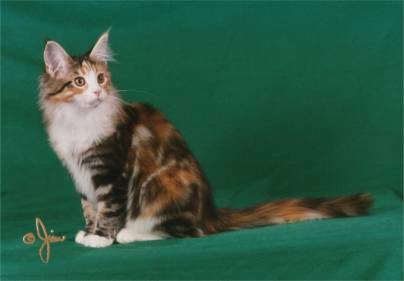 Moxie's fourth litter (one kitten, Puma) was born in April 2002; dad was QGC Smokeycoons High Plains Drifter. 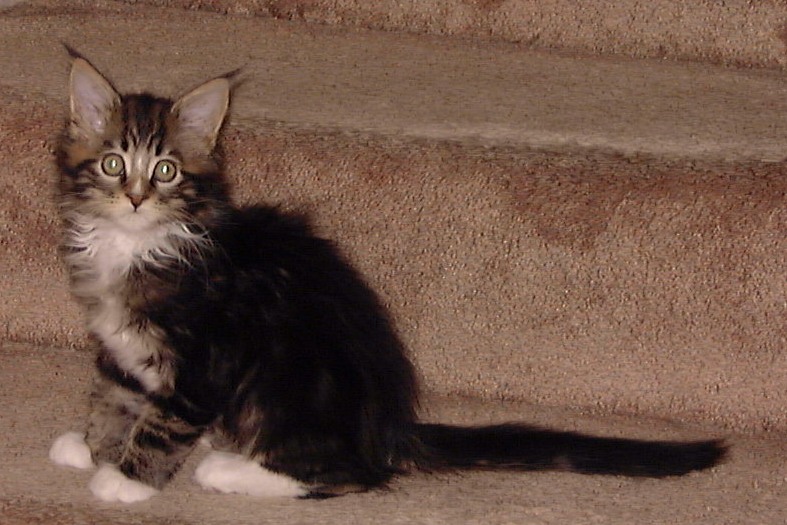 Moxie's fifth litter was born in March 2003; dad was Rumble. 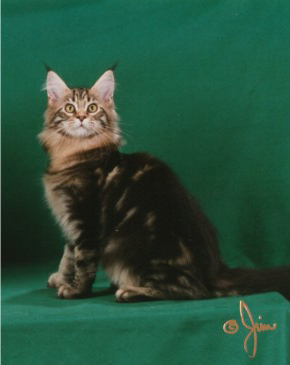 Moxie is a TICA Quadruple Grand Champion. Moxie is the sweetest baby -- she purrs literally all the time (even while being bathed or judged!). She is relaxed yet still extremely outgoing and affectionate, and is very goodnatured; nothing seems to bother her. She has inherited both her mother Hoppy's friendly fearlessness and her father Frosty's laid-back sweetness -- a wonderful combination. Moxie has a beautiful head with a long square muzzle and an excellent profile. Her chin is deep but not as square as we would like. She has huge ears with large, thick lynx tips. Her coat is long and shaggy, rarely mats, and feels wonderful to the touch, almost like rabbit fur. She has a long, hard body, and is densely muscled and surprisingly heavy for her size. Moxie's hips are good and her heart is sound (checked annually by a board-certified cardiologist).